Students at Red Bank Charter School took to the streets on Monday, carrying signs while marching through the community to mark the Rev. Dr. Martin Luther King’s birthday. The exercise was part of a series of events held Monday at the school to teach students about the legacy of the slain civil rights leader. 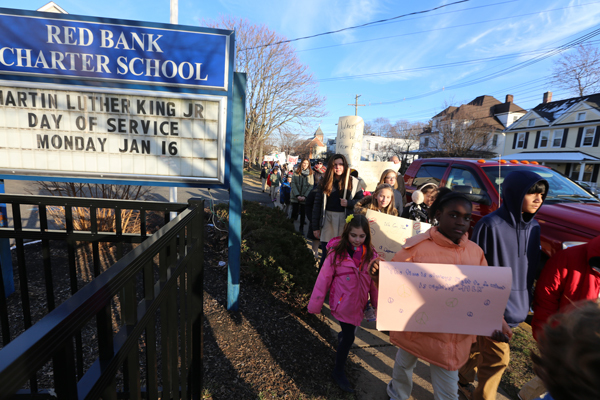 Red Bank Charter School Principal Meredith Pennotti said the school has opted to remain open on MLK Day to allow students to engage in a day of celebration and reflection. Red Bank Charter School is among the most diverse and racially and ethnically integrated schools in the state with a student body that is 43 percent white, 43 percent Hispanic and 12 percent African-American. The school’s curriculum includes a service-learning component in which students have the opportunity to complete activities in the community. The day began with teachers in every classroom handing out bagels to students. The exercise was designed to create fellowship among students. “We all need food, water and love,” Pennotti said. Students also created a CNN-like news program in which they produced segments about the Dr. King, the Taliban, the Dakota Access Pipeline and the controversy over their own school. A small group of Red Bank residents have incorrectly called the school segregated and are seeking to shut it down. In their news segment, the students sought to correct the misinformation being spread about their school. Students in the middle school grades also went to see the new movie “Hidden Figures,” a true story that celebrates the overlooked contributions of three African-American women working at NASA who played a crucial role in putting Americans into space. Maya Williams, an eighth grader at Red Bank Charter School, said the march had an impact on students from kindergarten to eighth grade. Seventh grader Ruby Smollen said she has participated in the MLK Day march since her kindergarten days.